On Eastern Avenue, just south of where Queen Street meets King Street, deep in a little pocket of industrial buildings wedged between Corktown and the Don Valley Parkway, is a junk-strewn brick building known, somewhat euphemistically, as “Innovation Toronto.” It’s been used at various times as a steel mill, a set for a TV series, and, allegedly, a homeless shelter. This past weekend, from Friday morning to Sunday night, the place gave shelter to a different kind of homeless community: Toronto’s burgeoning independent video game development scene. 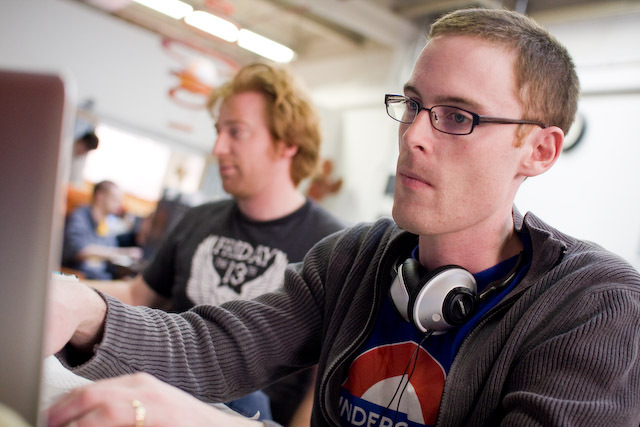 The event was TOJam 4, the fourth annual instance of Toronto’s one and only independent video game development jam. 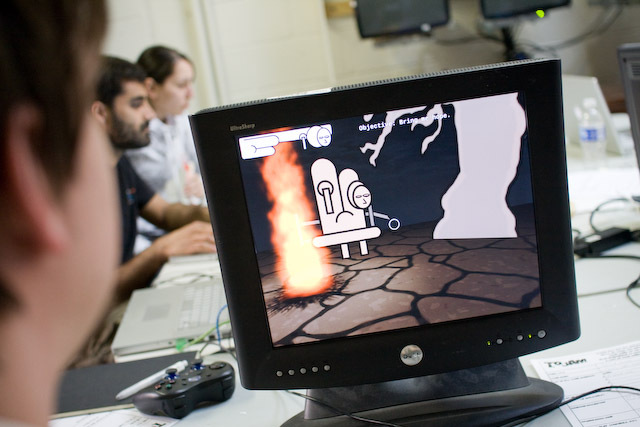 It’s a three-day-long, non-stop, fifty-eight-hour marathon, where Toronto’s do-it-yourself video game developers gather for a sleep-deprived weekend of game design, game creation, and, if all goes well, game display. All game-making must start and end between 10:00 a.m. Friday and 8:00 p.m. Sunday. TOJam 4’s eighty-nine participants are homeless not in the sense that they’re destitute or without places to sleep (though many of them do opt to sleep on-site in somewhat less than comfortable situations during the event) but in the sense that independent game development in Toronto has no official centre. These privations didn’t prevent an instructive scene from unfolding in the registration room, where two of TOJam’s four co-organizers, Jim and Emilie McGinley (husband and wife), were sitting. One of the event’s participants walked into the room slightly upset. He’d come wanting to write an iPhone app but had decided to scrap all that and write something for another platform instead. 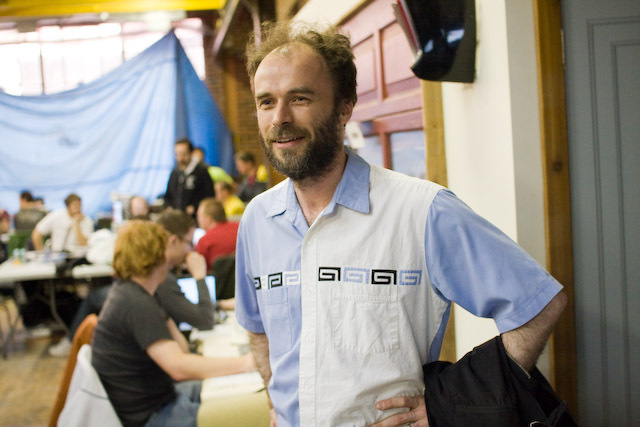 He described an idea to Jim that he thought would be appropriate to the official theme of this year’s TOJam, which was “scale” (last year’s was “cheese”). He wanted to do a game with a gecko, he said, because geckos have scales and they scale walls. A younger guy, Nicholas Andreae, who was attending TOJam as a “floater,” meaning a sort of all-purpose non-participating helper for graphical and audio details, piped in with his own refinement: there could be two types of tiles on these hypothetical walls, some of which the gecko would be able to walk on and some of which he wouldn’t. Now that’s a game we’d like to try. And it took three brains to think it up. And it took TOJam to bring those brains together. There were a lot of ideas zinging through the air, and their chance collisions were clearly catalyzing some amazing stuff. “This is a time for them to stop talking and start doing,” said Emilie McGinley. 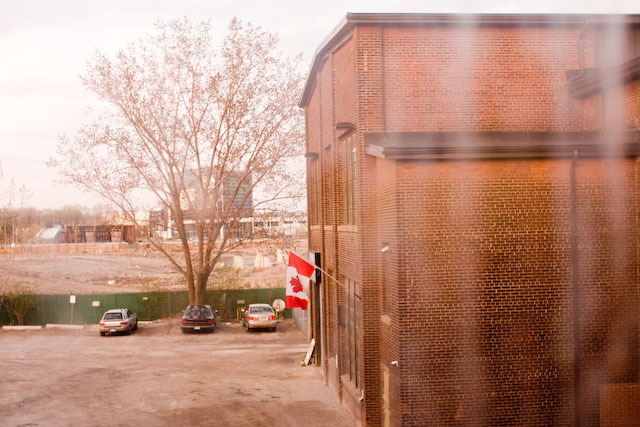 By Sunday night, with only an hour of crunch time to go, things in Innovation Toronto’s main room, a huge loft-like cavern with a fake kitchen left over from its TV show set days, are looking a little grim. The heat radiating from all the computers jammed into the space (of which there appear to be at least 1.5 for every human being present) has elevated the temperature to somewhere just shy of toasty. There’s a huge window that’s been covered partially by a blue tarp so the setting sun doesn’t shine in and, in the words of co-organizer Rob Segal, “bake the place,” greenhouse-style. It’s Hell’s IT department. The empty containers littering the tabletops include a can of Chef Boyardee ravioli with a fork sticking out of it, several cans of various energy drinks, several cans of beer, and an empty flask of Southern Comfort. Those who aren’t yet done with their games twiddle with screens full of data. Some of them have multiple lines of multicoloured code. Others are zooming around 2-D or 3-D environments. One person rotates a 3-D model of a TTC streetcar. There are little pockets of relaxation. The table belonging to the group of designers known as Team Awesome-O is the focal point of what looks like pretty normal gaming activity. 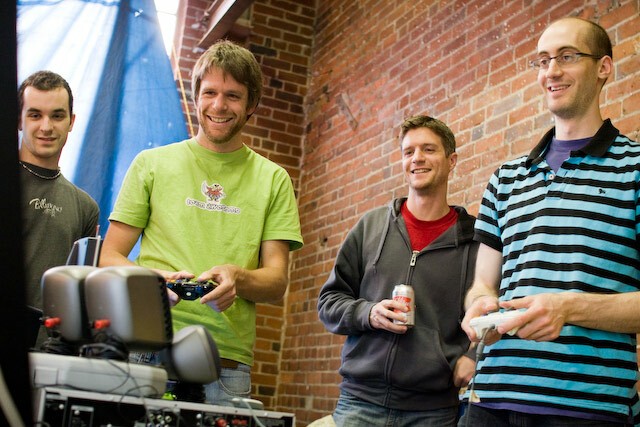 People stand around with controllers in their hands and enjoy the group’s game, and for a second it’s almost possible to forget the fact that other people spent three intense days teaching a computer to do all that. Elsewhere, Michael Todd, a developer with a few indie games already on his resume, shows off his game, Spirit Guide. The game consists of a 3-D environment that the player moves around in by jumping, using a gameplay mechanic Todd calls “jetpacking.” It’s a reasonably slick and atmospheric product, with subdued, eerie visuals. As Todd navigates through the last of three levels, a small crowd of appreciative onlookers starts to form. One of them wants to know what tools were used in Spirit Guide‘s creation, and the beauty of it is that Todd is sitting right there, glad to give an answer. “A positive feedback loop,” is how he describes the atmosphere at TOJam, and it’s clear that’s pretty apt. In a manner more supportive than competitive, TOJam attendees make one another better at what they do. Everything lacks the varnish of the monied-up output of industry behemoths, but the truth is these small, focused games don’t really need it. Not only that, but the games seem to be setting ever-higher standards. “The quality of the stuff over the years has just been getting better and better,” says Jerry Liang, another TOJam 4 co-organizer, who was a participant in the original TOJam in 2006. This notion of gradual improvement turns out to be part of the reason he chooses to devote himself to the event year after year. “When I was in school,” he says, “I really wanted to get into games development.” But an aversion to the games industry’s dominant culture forced him to choose another career. TOJam, for him and everyone else trying to make games in Toronto, might represent the germ of a new beginning, we suggest. All TOJam 4 games will soon be posted for download by the event’s organizers on the official TOJam website. They’ll also be playable at the annual TOJam Arcade, a pub event that takes place a few weeks after TOJam. Watch the website for details.